On 9th June 2016 Lord Berkeley of Knighton led a short debate to ask Her Majesty’s Government “what steps they intend to take in the light of NHS statistics showing that in 2015 over 1,000 cases of female genital mutilation were reported every three months and the lack of any successful prosecutions to date.” The Bishop of Derby, Rt Revd Alastair Redfern, spoke in the debate, highlighting the historic and cultural influences behind the practice and the work taking place at a local and grassroots level to reduce instances of FGM and support the law. 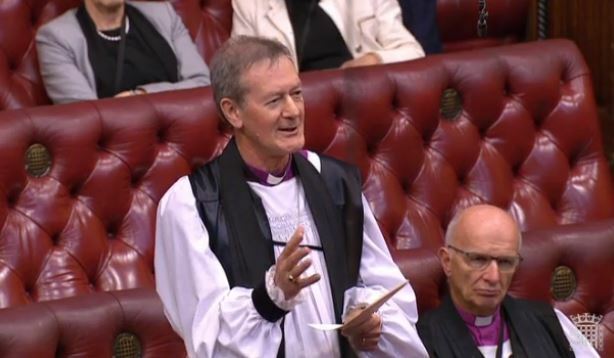 The Lord Bishop of Derby: My Lords, I, too, thank the noble Lord, Lord Berkeley, for introducing this vital debate and making the point that we need to keep this subject in the public domain to raise awareness and challenge people. I want to offer some perspectives from my experience in Derby, where I operate as a bishop at grassroots level, to try to help understand why we are in this position and how we might best tackle things. Your Lordships will know that FGM is a very ancient practice going back to at least the fifth century BC. It was mentioned by Herodotus, especially in Egypt and Ethiopia, all that time ago. I remind noble Lords that FGM was practised until the 1950s in western countries as part of dealing with what was then called “female deviancy”. Things such as hysteria, epilepsy and lesbianism were dealt with by this horrific practice as an enlightened medical approach to those conditions. We have to recognise that it is not only deeply embedded in ancient culture, but until quite recently in the west, we have been implicated in using this barbaric method for medical reasons. The noble Baroness, Lady Finlay, and the noble Lord, Lord Berkeley, have been very clear about the physical and psychological damage that FGM causes and about the sheer scale. I think I am right in saying that even today in Egypt, 90% of girls are cut between the age of five and 14, and in Yemen 75% of girls are cut before they are two weeks old. I mention those statistics because that shows how, as people move into Europe and our country, the culture is reinforced by new recruits who inhabit it. So it is not simply a matter of having a law and fighting back; the problem comes from all over the world into our midst as we speak. There are four “reasons” in the background why FGM is and has been prevalent. One, as we have heard, is to do with culture and faith frameworks; one is to do with the idea of a rite of passage; one is to do with concepts of purity and virginity; and one is to do with the control of female sexuality. Of course the Government must take a lead in their policy and legal framework but, as someone who was involved in the legislation against slavery, I would observe that it is very difficult to express in law something that can work effectively. With slavery, as with this issue, prosecutions are very low. Therefore, besides the Government giving out a proper signal and benchmark that this is unacceptable and barbaric, we have to work at all kinds of other levels, especially the cultural and faith ones, if we are going to really try to turn the tide. In the work I have been involved in with colleagues in Derby, there are a number of methods of trying to enable an enlightened discussion. We have much to learn because the areas concerned—gender, the role of women and sexuality—are ones that we in the West struggle with too. We have to be careful about saying that we have all the answers and other people just need to jump to our solutions; we can have fruitful discussions with friends and neighbours from all kinds of cultures about gender, female sexuality and the role of women in society. From my experience, there are four issues which I invite the Government to think about in terms of their own investment and encouragement. The first is appropriate spaces for conversations, the sharing of stories and the sharing of cultural faith hinterlands. How do we create the kind of space that is safe? Secondly, there is a very challenging issue which we in politics ought to know about: pace. There is a great danger of moving on to the offensive, which will cause a defensive reaction. We need a conversation and debate that is paced so that people can get into it, be influenced by it, participate in it and be changed by it. We have to be very careful about wagging a big finger, so that people do not just think, “Well, that’s western liberal culture, and we have something precious to preserve against it”. The third thing that we have learned is that the official agencies—the law, safeguarding and local authorities—have limited resources and are regarded by people in a limited way. Therefore, although they must do the policing and act out the standards, they need the support of the informal grass-roots sector, where friends and neighbours can have conversations, listen to each other, share stories and raise aspirations of what is possible, right and desirable. Fourthly, we had a day conference in Derby and did all sorts of informal work with other churches, faith groups and community groups. As a result, we now have 10 community champions, providing community support and signposting at grass-roots level, looking out for the opportunities for those conversations, encouraging them and getting people in the circle, so that there can be genuine change that people have signed up for and committed to, rather than jumping to an abstract law that is thundering towards them. So my simple question to the Minister is: how might the Government take seriously that important grass-roots work, which requires a particular kind of space, pace, community champions and informality, and which will have an enormous effect in reinforcing the formal law and systems? How might the Government encourage and invest in that work, which would achieve real change and pushback? How might that be part of the action plan that, as has rightly been said, needs to be put on the table?